Perpetrated of course by criminals, but increasingly now too by criminal governments who act in defiance of the very Constitutions set up to restrict their powers, the attack on Privacy is relentless. The net effect of this two-pronged attack on us then, is that all of us need the very toughest and most advanced Computer Security that we can lay our hands on. The revelations of N.S.A. whistle-blower, Edward Snowden, starting back in June 2013, served only to “officially” remind us, of what alert individuals have long known to be true … and that is, that without taking serious steps to protect our own Privacy & Security, then our online lives and data, are a virtual “open door”. That investigation is now complete, and the result is the publishing of the following Security Report, which represents the most cutting edge, “step by step” guide available on the subject to date. It is a Guide that brings together the very “best of breed” solutions that are available in the industry today, and it will walk you right through the critical steps we all need to take. All the way from the vital foundations that need to be put in place, right through to genuinely “military grade” security software, as well as other software solutions and strategies, that will give you the maximum peace of mind and protection possible today. Beyond that, Q Wealth Report have also arranged deep discounts for “Done For You” and Consultancy services, offered by our computer and Cyber security partners. But just how did we ever find ourselves in this position in the first place? How did we find ourselves having to go to these extraordinary lengths? In other words … How did we end up having to protect ourselves, quite so much anyway? Well in order to answer those questions, we really need to take a brief look back in time, to see just how and where the recent accelerated levels of privacy invasion came from. Allow us then to put the recent massive rise in “dragnet security” and “upstream surveillance”, into a little bit of historical context. 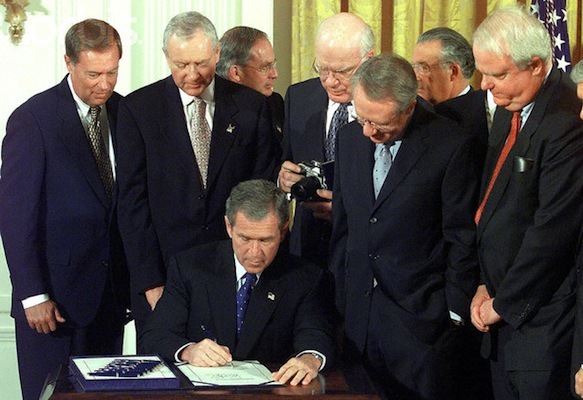 In the wake of “9-11” … the Bush Administration hurriedly declared their “War On Terror”. Striking “while the iron was hot”, by taking advantage of fear and a national grief, as well as a desire for revenge, they rushed through multiple pieces of extremely complex “security legislation”, literally within days. Such was the flurry of activity, that many felt that these measures simply had to have been written and prepared, long before the event, with some even suggesting that they were just waiting for the “right crisis” to come along, in order to unleash them. 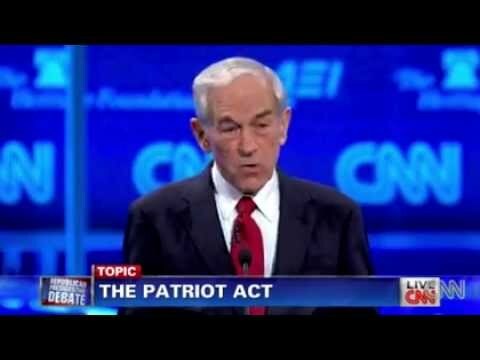 Consider that The Patriot Act alone for instance, was almost 60,000 words long, weighed in at 365 pages, and created or amended almost 150 Laws, Acts and Statutes! And all of that was researched, written, reviewed, and released … all in just 25 working days from 9-11 ?! But wherever the truth lies (no pun intended) … one thing is for certain … and that is, that the world-changing events on 9-11, without question, provided the Administration with the exact pretence and “justification” required, to create The Surveillance State that is now so firmly in place. Almost immediately, a new “Department of Fatherland Security” … (sorry we meant to say “Department of Homeland Security”!) was formed. Then the powers and authorities of the T.S.A. (Transport Security Authority) were also “upgraded”, leading to it being dubbed by many as a “Gropers Charter”. Alongside these these two behemoths, a virtual “alphabet soup” of further legislation was also proposed or passed. The powers and authorities of the T.S.A. (Transport Security Authority) were also “upgraded”, leading to it being dubbed by many as a “Gropers Charter”. 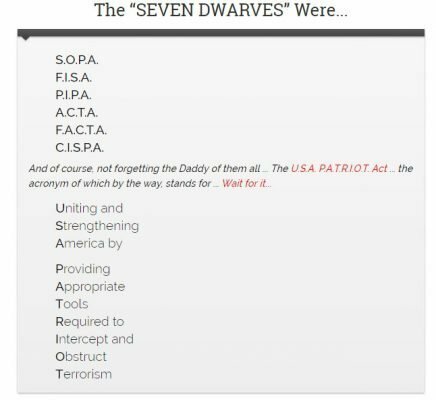 Alongside these these two behemoths, a virtual “alphabet soup” of further legislation was also proposed or passed. The committee who came up with these, must have been up all night! And to think that most people thought that it was all just about “being a Patriot”! You really couldn’t make this stuff up! 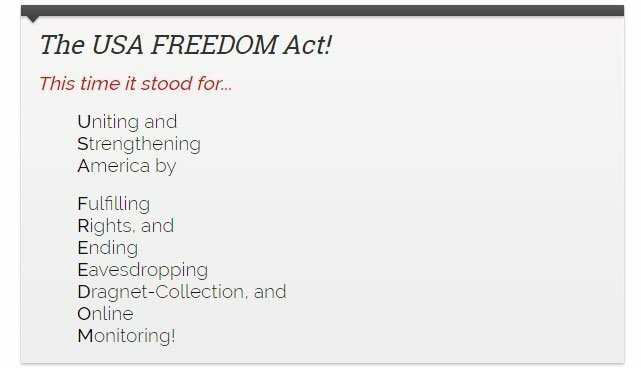 But now as the years have passed by, let’s just say that the Freedom Act seems completely toothless, in comparison to the still draconian Patriot Act, and looks like just what it was simply a “token gesture”, put in place merely in an attempt to pacify the chorus of public protest. The original “unpatriotic” Patriot Act then, represented one the greatest assaults on personal freedom in history, and was rushed through Congress with unseemly haste. So much so, that astonishingly, the majority of Members of Congress didn’t even read a single word of it, before they were pressurised into passing it into law. It was a staggering exercise in political coercion and “arm twisting”… or was it “democracy”? Many were confused. You and a friend are returning from a business trip. 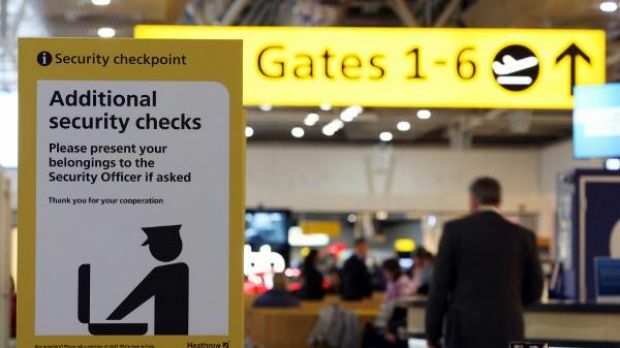 You’re both passing through airport security in parallel queues. You’re are both stopped at the same time by security agents. What transpires next, will mean one of you has a “normal day”… but the other, will have a really, REALLY “bad day at the office”. The bottom line, is that you’re both about to face a huge moral dilemma, and an assault; an assault on your privacy. Crucially though … only one of you though will deal it “the smart way”. ​You have both been singled out for what the agents call a “routine manual search”. 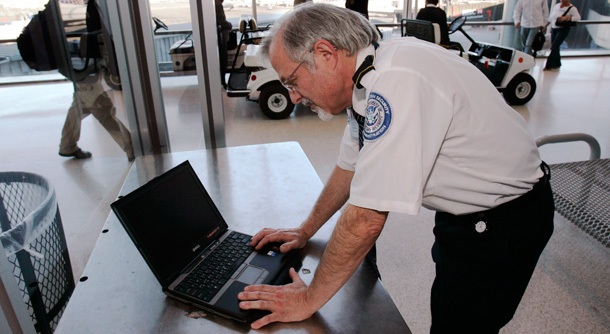 As part of that search, the TSA agents ask you both for the “password for your laptop”. As part of that search, the TSA agents ask you both for the “password for your laptop”. You can see the dilemma developing can’t you, and obviously neither of you is happy, at all, about such intrusion and invasion of privacy. ​And so this really is “where the rubber meets the road” time. And so just what DO you both do? “It is your friend who reacts first … They decide to “stand on their privacy principles”, and they refuse the request … declining to divulge their password!” to “stand on their privacy principles”, and they refuses the request … declining to divulge their password! “Hmmmm … this will be interesting!”, you think! The Result? The result was just as you suspected. Your friend is promptly arrested … and their laptop is confiscated! And now they get to spend some really “uncomfortable” time, in a private “rubber glove” interrogation room, being questioned by aggressive TSA agents who haven’t had a refusnik to play with for a few days. Only in recent times, have such heavy-handed tactics by agents even been made “legal”, and hence as always, freedom loving people are once again having to “adapt to survive”. Such warrant-less and Constitution-defying “Search & Seizure” tactics of course, are still completely illegal, were they to happen anywhere else in the country, (especially without “probable cause” or a warrant). But they are perfectly legal, at airport and border security checkpoints! But let’s rewind a little bit … Let’s see how “you” handled that same situation in our Tale! So how did “you” react, when faced with that same request? After all … aren’t “your” principles on privacy, every bit as precious to you as your friend’s were to them? The difference though, as you will soon see … is that you had made some REALLY smart decisions and moves … long before you stood in that security line! ​What was “your” response to the agents then? Your response was to immediately supply the Agent with your password … just as requested! No questions asked! OK … so did that mean that you had “abandoned your principles”? ​No, not at all … as we will very soon see. ​The Agent then opened up your laptop, tapped in your password, and had a good old “snoop around”. All they saw though, was a perfectly normal Operating System, and normal, innocent files, data and contents. But … “all was not as it seemed”. Because what that agent in fact saw, was not “everything” on your hard drive. What they saw, was only the “publicly visible” part of your data. In other words, what they go to see, was only the data that YOU were prepared to let them to see! What they didn’t get to see, was any any of your sensitive “business data” or “personal data”. ​This stunning, state of the art Guide, has been created to protect your “privacy”, and your “principles”! ​To allow you to “comply”, without having to “compromise”. The Guide is a comprehensive, concise collection of the very latest “Personal Privacy” and “Cyber-Security” solutions that are available in the market place today. It is a step-by-step study, that walks you through practical protection strategies that you can deploy immediately, to protect yourself. The Guide systematically builds into a practical knowledge base, that builds multi-layered security around every aspect of your computer life. On page 26 of the Guide for instance, you will find details of the specific “layer” of security that “you” used, in “The Tale of Two Laptops”. That “layer” is called the “Plausible Deniabilty Layer”, and the Guide shows you exactly how to implement it. But just to give you a hint, the strategy involves “encrypting only your most sensitive data” … and NOT all of your data. But why does it recommend you do it that way? Why perform only “selective encryption”, rather than “blanket encryption”, of your entire hard drive? Surely applying “uncrackable encryption” to your entire hard drive, secures everything, and that has to be a good thing, yes? Well … no actually, it’s not. It is very much NOT a “good thing”, and it can lead to you having an infinitely worse “day at the office”, than even your “friend” in the Tale of Two aptops had to endure! Here’s a hint … Trust us … you do NOT want to go through … “Rubber Hose Cryptanalysis”! Page 30 of the Guide outlines exactly what that is, and why, at all costs, you need to avoid it. Now we’ll share other “layers of security” strategies from the report with you, in just a few moments … but in the meantime, lets just quickly go back and see how YOUR “Plausible Deniability” software strategy worked out … as opposed to your “friend’s” painful experience. Quite simply put, satisfied that their initial “manual analysis” of your laptop has revealed nothing untoward … the agent quickly sends you on your way, none the wiser as to the contents of the secret files, safely hidden out of sight. 1. You still have your laptop! 2. You don’t have to convince a judge to let you have it back! 3. Your private and business data is STILL secure! 4. Your concerns and principles about “privacy” have been honored! 5. And, you’re free to get on with the rest of your day … in peace! Now THAT, is what’s called “working smart”! And THAT, is how a “very private person”, ends up being “happy” to go along with a TSA agent’s request. Well ok … maybe “happy” is too strong a word for it! The “key” though, is that we simply have to be prepare “ahead of time” for these situations … and that is what “The Complete Guide To Computer Security For Mere Mortals” is all about. Complete Browser Security: Protect and make your browser safe against unwanted spam and phishing programs . Complete Email Security: Secure your laptop against all unwanted spam and virus, or data phishing emails. Complete Laptop Security: There are many different grades of laptop Security, from securing your emails and enjoying private browsing, right through to complete data protection. Get Started Now With a 30-day No Risk Money Back Guarantee! On top of all that, for those wanting to go to the “Next Level”, the Guide shows you how to obtain your own “Totally Secure Laptop”. These laptops truly are “state of the art”. Fitted with genuinely “Military Grade” 256-bit Loop AES encryption, they are as close to impregnable as its possible to get right now. 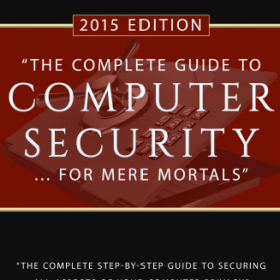 So whatever your needs are, the brand new, 2015 edition of “The Complete Guide to Computer Security for Mere Mortals” is ready and waiting for you. Simply click on the link below, and you will have immediate access to a Guide that will change forever, how secure you feel.